For decades now, serial killers have taken center stage in the news and entertainment media. The coverage of real-life murderers such as Ted Bundy and Jeffrey Dahmer has transformed them into ghoulish celebrities. Similarly, the popularity of fictional characters such as Hannibal The Cannibal” Lecter or Dexter demonstrates just how eager the public is to be frightened by these human predators. But why is this so? Could it be that some of us have a gruesome fascination with serial killers for the same reasons we might morbidly stare at a catastrophic automobile accident? Or it is something more? In Why We Love Serial Killers, criminology professor Dr. Scott Bonn explores our powerful appetite for the macabre, while also providing new and unique insights into the world of the serial killer, including those he has gained from his correspondence with two of the world’s most notorious examples, David Berkowitz (Son of Sam”) and Dennis Rader (Bind, Torture, Kill”). In addition, Bonn examines the criminal profiling techniques used by law enforcement professionals to identify and apprehend serial predators, he discusses the various behaviors—such as the charisma of the sociopath— that manifest themselves in serial killers, and he explains how and why these killers often become popular cultural figures. 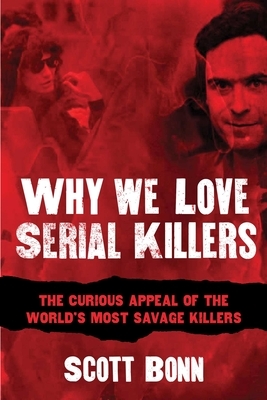 Groundbreaking in its approach, Why We Love Serial Killers is a compelling look at how the media, law enforcement agencies, and public perception itself shapes and feeds the monsters” in our midst. Dr. Scott Bonn is a professor of criminology at Drew University in Madison, New Jersey. His expert commentary has appeared in the "New York Times," the "Huffington Post," Headline News Network, and more. Dr. Bonn hosts a weekly college radio show and has recently appeared as an expert analyst in the A&E documentary "The Long Island Serial Killer." The author resides in Manhattan, New York.